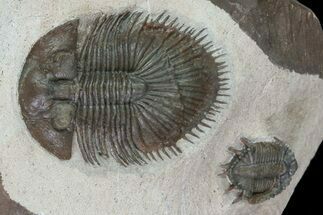 This is an exceptional trilobite mass mortality plate collected at the Jorf, Morocco "red site". 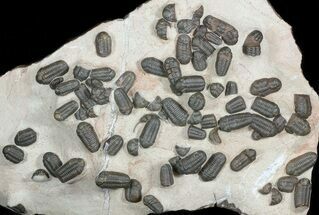 The entire plate measures 14.5 x 10" and there are 20 complete Basseiarges trilobites, a couple of ventral Austerops trilobites and many partials of several different species. The rock from this locality is extremely hard with an almost glass-like texture making it difficult to prepare. The shell of the trilobites is actually translucent, so it is taking on the reddish color of the rock below. 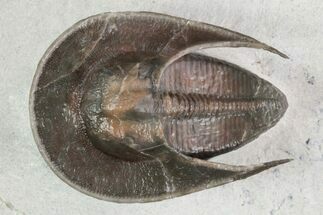 Basseiarges is a fairly uncommon trilobite at the locality so a plate like this is a very rare find indeed. A real museum piece.